Christmas has come. We’ve celebrated the birth of Christ, but we are still waiting for him to come again as he promised. The birth of Christ is only part of the story. The story continues and is marked at every turn by commitment and sacrifice. Every good thing worth having comes through commitment and sacrifice. Listen to the extended story of Christ’s birth and childhood. 41 Every year Jesus’ parents went to Jerusalem for the Festival of the Passover. 42 When he was twelve years old, they went up to the festival, according to the custom. Many people want their spiritual life to be spectacular—to be filled with passion and miracles and signs and wonders. They want worship to always be special; maybe that’s why so many only attend church on Christmas or Easter. People want spirituality, not religion; they want to feel God’s love, but they don’t want to practice religious disciplines. But that’s not the way things usually work in real life. We don’t usually have a spectacular spiritual life if we don’t practice the daily commitment of religious discipline. Furthermore, the signs and wonders of God’s intimate and powerful presence in our lives usually happen when we are in the midst of our daily spiritual habits. Mary and Joseph were just ordinary people like you and me, but the Bible also describes them as godly people. They prayed. They worshiped. They study God’s Word. They were committed to their religious duties. It was in the midst of this religious life that the Angel appeared to Mary and the Holy Spirit conceived Jesus. It was in the midst of a godly religious life that the Angel appeared to Joseph in a dream and told him to remain committed to Mary, for she was pregnant with the Son of God. And after the child was born, we see Mary and Joseph continued their religious duties. They circumcised Jesus when he was 8-years-old, they followed the purification rites according to the Law of Moses, they continued their regular religious duties and even traveled to the Temple in Jerusalem every year. They also trained Jesus to be a faithful Jew. By the time he was twelve and they took him to the Temple in Jerusalem, he had been studying the Bible (The Torah actually, which was the jewish Bible) and practicing his religion faithfully and knew the Word of God as well as the religious scholars. Practice makes perfect; that's true in you spiritual life as well as anything else. And it was true for Jesus too. In our text this morning, we also see the religious commitment of an old man named Simeon. He was righteous and devout. And there was a widowed prophet named Anna, who was 84-years-old. It says, “never left the temple but worshiped night and day, fasting and praying.” A very “religious” woman, but her determined, daily commitment to religious practice (and also Simeon’s) led to a spectacular, once in a lifetime spiritual experience. They both get to see and hold and pray with and bless the baby Jesus. Things worth having are worth waiting for, working for, fighting for, and never giving up on. The biggest, most important blessings in life come through commitment. We celebrate the special moments of life—when a youth graduates from high school, a young couple get married, the birth of a child, etc. We flood Facebook and Instagram with pictures capturing these special milestones. But these moments in and of themselves are nothing if not bathed in deep, daily commitment. It is not the marriage ceremony or the pictures that matter; it is the love that the bride and groom have for each other that compels them to remain by each other’s side in good times and bad time, for richer, for poorer, in sickness and in health their whole life long. We anticipate the glorious birth of a child with a young couple, but the true glory is in the old women and men like Anna and Simeon who have lived a life of deep commitment and sacrifice, raising children and grandchildren, serving their friends, their church, their community. Over the last month, I’ve shared about many different kinds of prayer. We can experience some very special and intimate spiritual time with God through many different types of prayer. I want to share one more. It is called covenant prayer. A covenant is an agreement. It is a promise between God and His people. Throughout the Bible, God has promised to care for His people. And God calls His people to be committed in our relationships too--with people and with God. A relationship can only go as far as our commitment to one another. That’s why a man and a woman decide to get married and promise to love each other until death. It assures the couple they can trust each other at the deepest, most vulnerable levels of life because they can trust their partner will not abandon them no matter what. The same principle applies in our spiritual lives. If you want a deep spiritual life, if you want to experience the spectacular power and loving presence of God in your life, you’ve got to be deeply committed to God. If you want real answers to the deep questions of life that go beyond those trite clichés, you’ve got to be deeply committed. If you want true healing from terrible scars, freedom from heavy chains, or true hope in the midst of hopelessness, you’ve got to be truly committed to the Healer, Liberator, and Source of all Hope. Why would God cast His pearls before swine who would only trample them in the mud and then break out of the pen to run away to some other field? Our deep commitment to God is an essential act of prayer that opens up true and deep communion with the One who makes life worth living, who brings answers to our most important questions, who shows us questions we never even thought to ask, and grants us true peace as we walk through life in the midst of His perfect will. How Will you Be Committed in the Coming Year? Our Covenant Prayer with God encompasses many areas. There is the covenant of holy obedience. God is the rightful ruler of all. He deserve our obedience, not because of anything He has done for us, but because He is Lord of all. Will you make a covenant to put obedience to God above yoru family, you nation, your career, everything? Will you obey even if it makes you look strange or cost you? There is the covenant of time. We you make your time with God your first priority? Prayer, worship, study, and service are important but not necessarily urgent. There are always other commitments that try to steal your time, claiming to be more urgent that your devotional time. And the truth is, the sky is not going to fall if you skip church or your prayer time or reading your Bible. However, over time, we grow weak as we neglect the important religious exercise of prayer, study, worship, and service. You will always reap what you sow. And for years, decades, centuries, Americans have been neglecting these critical elements of religious life. That's why we and our families and our communities have grown so spiritually weak. Will you make a covenant with God to be faithful with your time? There is the covenant of place. We all need to worship, study, and pray in private. But we cannot only do these in private. We must also be part of a community of faith. You cannot be a Christian only in private. Christianity is a communal experience. Will you make a covenant to be part of the Body of Christ--to worship and serve the Lord in the Church? Where will that be? There is the covenant of preparation. Will you covenant to come to worship prepared to be in the presence of the Lord? So many people complain, "I don't get anything out of worship when I come to church." Often times, those are the same people who stayed up extra late on Saturday night and who barely made it to worship on Sunday, who came in late, who sat in the pew the whole time thinking about what they would do for the rest of the day. They weren't prepared to worship the Living God and they weren't fully present while they were here. No wonder they didn't feel fed. Do you realize, in worship, you are in the presence of the Lord of the universe. He is so deep we cannot fathom Him, so infinite our finite minds cannot comprehend Him--even if we spent years preparing to visit with Him. And yet, we do so little to prepare to meet Him! We should at least begin preparing our heart on Saturday evening, get to bed on time, rise early on Sunday with plenty of time to spare, and be prayerfully asking the Holy Spirit's assistance the whole time to prepare us to meet our Lord in worship. Will you make a covenant with God to be prepared to meet Him regularly? There is the covenant of resources. Jesus said, where your heart is, there your treasure will be also. What you spend your time, energy, money, and resources on show what are your priorities. Will you make a covenant to put God first with your financial giving, your time, and your other commitments? For what you are truly committed to makes all the difference in what you receive spiritually. We receive our greatest blessings through commitment and sacrifice. I invite you to consider your covenant commitments for 2019. I pray you will be fully committed, willing to sacrifice for the Kingdom of God, and thus receive the full blessing God wishes to grant you. Throughout the season of Advent, we’ve been studying prayer. Prayer is so much more than we might have thought. We can pray and ask for God’s help--help with our lives, help for those we love. That is a type of prayer--intercessory prayer or petitionary prayer. But there is more to prayer than just that. Prayer can be meditating on Scripture. It can be reflecting and examining your day. Prayer can be celebrating Holy Communion or worship or other responsive readings or traditional prayers. Prayer can be surrendering to God and allowing Him to change us. At its heart, prayer is spending time with God as a child spends time with a loving parent. And when we do, the Father shares His love with us and teaches us and molds us into His perfect image. On this Christmas Eve, as we celebrate the precious baby that was born in a manger, I want to tell you a little about another kind of prayer. It’s called The Prayer of Adoration and it is a fitting lesson as we pause to remember and adore the Christ-child born to save the world from sin. 1 At that time the Roman emperor, Augustus, decreed that a census should be taken throughout the Roman Empire. 2 (This was the first census taken when Quirinius was governor of Syria.) 3 All returned to their own ancestral towns to register for this census. 4 And because Joseph was a descendant of King David, he had to go to Bethlehem in Judea, David’s ancient home. He traveled there from the village of Nazareth in Galilee. 5 He took with him Mary, to whom he was engaged, who was now expecting a child. Can you imagine those shepherds that night standing before the baby Jesus, adoring him. And later the wise men also came from the East to bring gifts of gold, frankincense, and myrrh. They gave their gifts and adored the baby who was born to be king of the Jews and Savior of the whole world. We don’t know how many others might have laid their adoring eyes on the baby--whispering sweet “goo goos” to him or lovingly cradling him in their arms. It seems everyone wants to come see a newborn baby. We can probably imagine what it was like for them to adore baby Jesus. If we have ever seen a newborn child or held a tiny little infant, light as a feather, if you’ve ever seen those tiny little hands grasping your finger while looking up at you with bleary eyes (seeing everythig for the very first time), then you know something of the wonder of those who gathered around the manger to adore the baby, Emmanuel, God with us. Isn’t it strange that we would be so captivated by a baby? A baby doesn’t do anything except be “cure”; however, people still adore babies. To behold a baby brings us joy and wonder and hope. Babies have the power to fill our hearts with love and it’s not a selfish kind of love; it’s the kind of self-sacrificing love that would make a complete stranger risk their life to save a baby. God designed us to adore little babies, to love and protect them. It is an innate part of our character to love little babies this way. No one has to teach us. And so it was that God came into our broken world as a tiny little baby. And the shepherds came--men who I’m sure were rough and tough from surviving the cold winter nights while protecting their flocks from wild animals and ruthless thieves. They came and were overcome with wonder and awe at the sight of a little baby in a manger. They adored him. We, too, are invited to come and adore Jesus. Adoration is an act of prayer and it’s actually what we were designed to do. God created us to love Him and be loved by Him. All creation praises Him and we are the creations crowning glory. To adore is as natural to the human spirit as breathing, but we don’t always adore God as we should. There are several reason we get distracted and don’t adore Him as we should. We are in too much of a rush. We are always so busy doing doing “important things” we don’t slow down enough to notice all the amazing signs of God’s presence all around us. I wonder how many people in busy Bethlehem failed to notice the young couple Mary and Joseph and their newborn baby. And even of those who stopped in to take a quick look, how many took the time to really soak in the wonder of it all and to turn their hearts to adore the glory of God who is the giver of life. I also wonder how often we fail to slow down enough to notice the glory of God all around and lift up a prayer of adoration to God. We often fail to adore God, because we are stuck worshipping idols. When I say we worship idols, I don’t mean some statue we bow down to. An idol is anything that takes the place of the one true God, anything you turn to for the fulfillment that only God can give you. We can make an idol out of money, power, our career, our church, even our spouse or our kids. Many of the things we adore are good things, but they are bad for us when we seek fulfillment from them that we can only get from God. Idolatry is dangerous for us and for the things we worship. So we have to slow down and we have to focus our adoration on the One who truly deserves it. He is the One who made us. He is the source and sustainer of our life. He is the God who loves us and daily blesses us with signs and wonders designed to turn our adoring hearts upward toward Him. But we have to slow down and turn our eyes away from the blinking distractions of our noisy world in order to take notice of the subtle beauty and wonder of the Lord of all creation. He is the One who came down from Heaven and was born in a tiny manger for us to adore. He is the One who walked among the sick and lonely and poor, who spoke in parable that only those with ears could hear. He is the One who died on a cross to save the world. He is the one who bore a cross, the symbol of a lost cause, and turned it into a victory worthy to love and adore. We out to continually give thanks and praise to God. Thanks is adoring God for what God has done for us. Praise is even more wonderful; it is adoring God simply for who He is without any regard for what He’s done for us. Praise is selfless adoration of the Lord. We can give thanks. We can praise Him. We can magnify Him. To magnify is to try to exaggerate how wonderful God is. We sometimes brag and exaggerate how great we are, but I bet you can never over-exaggerate how wonderful God is. Give it a try. I bet you can’t over-exaggerate how wonderful God is! In his book Prayer, Richard Foster recommends we start with simple things in adoring God. Rather jump right to the grand and cosmic scale of how wonderful God is, look at a baby. How wonderful is the God who would create human life and cause it to begin in a tiny little child--so fragile and yet fully formed and amazing. Don’t analyze and study, just be amazed at the miracle of life and adore the One who created it. As we regularly adore God as revealed in the little things, we train ourselves to see and adore God everywhere. As we become more filled with wonder about God, we can begin to thank and praise and magnify Him. This Christmas, I pray you will slow down and refocus. See the baby Jesus in the manger, born to save the world. Adore him. For He is God. It is what you were born to do. Advent is the season where we get ready for Christmas. It’s also the season we remember that Jesus is coming again and so we work to be ready for that Second Coming. We prepare our soul through prayer and fasting and worship and study and service. Advent is nearly at an end. Christmas is in two days. Are you ready? It’s been a long, busy season. We’ve worked hard. We’ve studied many types of prayer. I’m looking forward to the Christmas break when we can rest a bit. We need rest. I need rest. Part of prayer is learning to truly rest in God, even in the midst of chaos. So today, let me share about what is known as the prayer of rest. Who couldn’t use a little more rest? As children, we often fought our parents when they tried to make us take a nap. (When I became a parent, I learned how blessed it could be to make your child take a nap--because it gives you a moment to rest too!!!) As adults, there always seems to be too much to do and never enough time to rest. Some people would kill for a little extra nap time! I have Good News! God wants you to rest! When God created the heavens and the earth and everything in them, He established a holy rhythm for life. There were six days to do the ordinary work of life and then the seventh day was a special day to rest. It is was a wonderful gift God gave to humanity--a special day just for rest, to leave off from the stress and strain of regular work and just enjoy sweet communion with God who is the source of life. But people, who are overwhelmed with sin, always strive to gain more, more, more. God wants to give us rest, but if we rest, we might miss out on some of the “more” that we desperately want. We say we want rest, but when we have the choice between entering into the Lord’s rest or chasing after more (more money, more fun, more stuff, more more more), we usually choose “more” over rest. If we are honest and if we really think on the matter, we realize our lack of rest is most often the result of our own choices and priorities in life. In the midst of this, Jesus invites us to rest. “Come to me,” he says, “And I will give you rest.” In other words, be my disciple (follow me, pattern your life after my ways instead of your own or the world’s example), and I will give you rest. Again, the choice is before us. We can choose His way that leads to rest, but we most often choose a different path that keeps us from rest. Sabbath, rest, means to rest in God. It is trusting in Him to take care of things without giving in to the nagging impulse inside that says we’ve got to make something happen. Sabbath rest is not so much “being lazy and doing nothing or sleeping all day”; it is letting go and trusting God to handle it (or else doing what He tells us to do according to His plan). Last January, me and my whole family came down with the flu. I was not able to go preach or lead worship at the church I pastor. Thankfully, my worship leader and choir leader volunteered to lead the service without me. They told me to stay home and rest and recuperate. They designed a prayer service with special music and different people from our congregation leading prayer. They designed and lead it completely without me. People loved it and told me how meaningful it was for them. It was so well-received, we decided to do ti again this year (not get the flu, but the service!). Furthermore, that same day, I was scheduled to lead a planning meeting where we planned all the activities for the 2018 year. I was supposed to lead the meeting. Thankfully, two ladies from my church stepped up and led the meeting. With the help of other leaders in the church, they planned all the activities for the calendar year. And it all turned out great! We had a great 2018 year full of wonderful programs. And it all got planned without me (maybe because I wasn't there). Step away from things. Go off by yourself for a time--a few hours, a few days. Rest in the Lord. Meditate on this eternal truth: One day you will not be here anymore. Do you think the world will not go on without you? Of course it will. And it will go on with you for a little while if you leave it alone and take a rest. In fact, things may work themself out just fine without you (with God’s help instead of yours). It may be that your absence is what is really needed in order for God to work it out. A third way to practice the prayer of rest is reflection. Through reflection, you take time to stop your work, rest, and intentionally reflect on your life. You consider: Who am I? What is my purpose according to God plan? You make time to reflect on God’s glory, what He has done for you, and His incredible power and ability to hold the whole world together. You empty your mind of all the things you have to do and instead consider the wonder of God and rest in His love for you and the reasons He gave you life. The Pharisees in Jesus' day were militant about the Sabbath. They believed you could not break it because God said so. Jesus came along and drove them crazy, because he kept doing things like healing people or picking corn on the Sabbath and they said it was against the law. Jesus said something different. He said the Sabbath was made to serve man not man to serve the Sabbath. The Sabbath is God's gift to us, not something we do for God's sake. Sabbath is different for every person. Exodus 20:8-9 says, “You have six days each week for your ordinary work, but the seventh day is a Sabbath day of rest dedicated to the Lord your God.” I added the italics to the word ordinary because I want to point out that everyone works in different ways and we need rest from our ordinary work. Most people work all week long and then rest on the weekend. I'm a pastor. My most important work day is on Sunday, a day everyone else considers a Sabbath. And I also work by serving God through religious activity. That is my ordinary work. So when I rest, I like to do something different--maybe build some furniture or work on a car. That is restful for me, even though it may be very physical. Resting for me often means not doing "church" stuff. For you it will probably be different. You need to take a break from your ordinary work routine and do something dedicated to resting in God. Maybe, you want to take a vacation. Great! But be sure it's a resting vacation. Sometimes we work so hard trying to pack more, fun, more memories, more, more, more into our vacations, they are anything but restful. Just slow down, take it easy, and rest. Notice that Jesus says “Take my yoke upon you.” A yoke is a tool to help oxen do work by pulling a loaded cart. So following Christ still means you will work. The difference is, the work will fit you so well it won’t seem much like work at all. On behalf of Christ, I invite you to come to him and rest. Lay your burdens aside and take his yoke upon you. Enter into the prayer of rest. I will meditate on your majestic, glorious splendor and your wonderful miracles. Acts 4 records the prayers of the early Christian Church as they faced severe persecution from the Roman Empire. They prayed “O Sovereign Lord, Creator of heaven and earth, the sea, and everything in them… And now, O Lord, hear their threats, and give us, your servants, great boldness in preaching your word. 30 Stretch out your hand with healing power; may miraculous signs and wonders be done through the name of your holy servant Jesus.” Acts 4:31 says, “After this prayer, the meeting place shook, and they were all filled with the Holy Spirit. Then they preached the word of God with boldness.” If the prayer was so effective for them, why not try praying it for our Church today? Hebrews 4:12 says, “For the word of God is alive and powerful. It is sharper than the sharpest two-edged sword, cutting between soul and spirit, between joint and marrow. It exposes our innermost thoughts and desires.” If the Word of God in the Bible is so incredibly powerful, think how effective it could be to use those words themselves as your prayers. But praying the actual words of Scripture is not the only way to Pray the Scriptures. Another way to pray the Scripture is to meditate on it. Meditation has been integral to God’s people from the very beginning. Genesis 24:63 tells us Abraham’s son, Isaac, went out into a field to walk around and meditate. Many of the Psalms were written as David meditated about God and His creation while he watched sheep at night. The Psalms themselves mention meditation 14 times. Devout Christians down through the ages have always practiced meditation. Meditation is a firmly established Christian spiritual practice. It wasn't until the last century that Christians got lazy about meditation so that it is more associated with the foreign religions of Buddhists and Hindus (or something reserved for the Karate Kid or Jedi Knights in Star Wars). What would it look like if you and I recaptured the powerful practice of Christian meditation? Christian meditation is fundamentally different from meditation in the Eastern religions. In those religions, a person tries to empty their mind and become completely absorbed into impersonal, cosmic consciousness. That is very different from what Christians believe. We believe God is a Person just as we are. We believe He is an individual with emotions and a personality. We believe God also made us as individuals in His image. So, we believe we can talk with God just as one person talks to another. Through Christian meditation we don’t seek to empty our minds. Instead, we try to let God fill our minds with His feelings, His ideas, and His insights as we focus our minds on Scripture and welcome Him to transform our wills. How Do You Meditate on Scripture? Studying Scripture is important and we should do it, but meditating on Scripture is something different that we should do too. When Christians meditate, we don’t analyzing the Scripture in order to merely get more information about it. We believe the Bible is the living word of God. Therefore, we try to commune with God through the Scripture. Start by choosing a short passage on which to meditate. Choose just one passage. Don’t try rush through many pages of Scripture. Just pick one episode and meditate only on it. You might pick only one verse or even just one word to meditate upon. Spend your entire time meditating on that one passage. Some have suggested spending a whole week on the same passage, coming back to it again and again. Sometimes you need time to move beyond just information gathering to where you are really entering into the text. Each time you return to the passage over a course of days, you may may go deeper and deeper. Try to relate to the story not just as something that happened a long, long time ago. It is something that still unfolds today. You are as much a part of God’s story as were the twelve Disciples who walked alongside Jesus on the shores of the Sea of Galilee. They were real people--His friends and disciples. So are you. Through Christian meditation, you open yourself up to the experience and start to feel the reality of Christ’s tangible presence with you, right now. Through your intimate, prayerful fellowship with Him, He begins to change your will. He confronts you, comforts you, challenges you, and inspires you. I want to close with a meditation on Genesis 22:1-8, part of the story where God asked Abraham to sacrifice his son Isaac. As I read the passage, close your eyes and try to imagine you are Abraham. What do you see, smell, hear, and how do you feel as you talk with God and your son and the other characters in the story? What is it like to chop wood for an offering that will take your own son’s life? What is it like to walk for three days trusting God while carrying the burden about what you are about to do all by yourself? You might be tempted to think, “I’m sure glad I’m not in Abraham’s shoes.” The Truth is, you are in Abraham’s shoes. We are all called to a sacrificial faith in God that puts everything on the line. So, as we meditate, how does it feel? Take your time and quietly reflect on how this passage makes you feel. resist the temptation to jump ahead and search for a happy ending. Remember, Abraham didn't know how the story was gong to end. And most of the time, we don't know how our troubles will end. We have to walk as did Abraham, buy faith--trusting God will take care of it, but not knowing when or how. 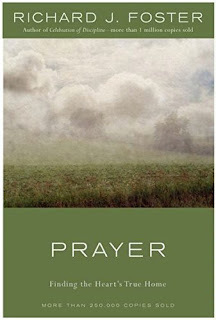 Use your imagination to be Abraham in the passage through meditation as you commune with God in prayer. I hope you found this blog helpful and will give Praying the Scripture (AKA Meditating Prayer) more attention. “Covenant Prayer is a profound interior heart call to a God-intoxicated life. It leads us to the crossroad of personal decision. Continual prayer (AKA unceasing prayer) is continual conversations with God. “If we truly love people, we will desire for them far more than it is within our power to give them, and this will lead us to prayer.